As compensation for it’s industrial and mining past, today Dortmund has a lot of green areas, parks and recreation areas. Known as a "green metropolis" of Westphalia, Dortmund offers its residents and tourists as a green oasis Westfalenpark park and Romberg. Westfalenpark is a place where one has the opportunity to spend time by yourself and with your family to learn new and pleasant experiences, even have unforgettable moments. Many residents of Dortmund prefer the peace and greenery of the park for family walks, picnics and relaxation, away from the noise of the industrial Ruhr area. The possibilities in Westfalenpark are many - the whole garden smells of roses for the beautiful Rosary, which can be visited here, everywhere the park has lakes , walkways, lawns, and above all stands a 220 m high TV tower Florianturm. Westfalenpark extends over 70 hectares, making it one of the largest urban parks in Europe. Opened in 1959, in place of the old site of Kaiser-Wilhelm-Hainz, and the Buschmühlenparks. Westfalenpark is open all days of the year and offers opportunities for sports, children's entertainment, and excellent cuisine. The park is one of the main places in Dortmund for the conduct of parties, festivals, concerts, theatrical and musical events and exhibitions for different market. Perhaps the most pleasant place in Westfalenpark is the German Rosary, which is unique in nature. The Rosary is a wonderful addition to the park where you can see over 3000 species of this delicate and beautiful flower. Here are regularly held and festivals, such as the Juicy Beats and the Light Festival (Lichterfestes). In the Rose Garden of Dortmund, a person can learn all about the roses, enjoy the variety of colors in a variety of designer ensembles formed to trace the origin and history of the color pink, and learn a lot about growing flowers and gardening in general . In this part of Westfalenpark can be seen a 65 meters long and 6 feet high wall, which is a giant canvas of colorful pink flowers. It is best to visit the rosary between May and November, because then the different varieties of roses bloom. To the rosary in Westfalenpark has a library that is continuously updated and enriched. 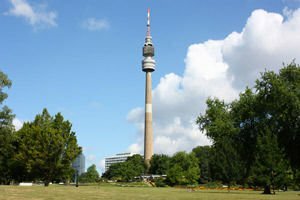 A high point in Westfalenpark is the Florianturm television tower, which is named in honor of Saint Florian - patron of the park. The tower was built in 1959 and the exact height is 219.6 meters. The giant TV is one of the favorite places for visitors to Westfalenpark because of it’s height 141.88 and 144.7 m, and there are two observation platforms. They are thorough in revealing a beautiful view over the whole Dortmund. The oval part of the tower has a pleasant restaurant. Whose platform revolves, allowing visitors to gaze at the constantly changing panorama.